Should Your Carpet be Replaced After Water Damage? It's likely that at least one room in your house has carpet. If water seeps into that carpet, it can cause a mess, whether it's from a flood or a broken pipe. The good news is that you can sometimes salvage carpet that sustained water damage. It depends on what kind of water leaks onto your floor, how much there was, and how long ago it occurred. Read on to learn whether or not you can fix water-damaged carpets. The first thing you should do is take a good look at the damage to your carpet. This will help you decide whether you can restore it or if you should decide to replace it. This all depends on what type of carpet you have, how long the water has been sitting on your floor, and where the water came from. If the water was from rain, it is probably safe to restore your carpet. If it came from a toilet or a broken pipe, it could be contaminated — and you will need to replace your carpet. Contact your insurance agent as soon as the damage occurs. If it's from water damage, it will most likely be covered under your homeowner's insurance policy. Flood damage is usually only included if you have purchased a separate flood insurance plan, however. Wait to do any work on your carpets until you hear from your insurance agent. They may pay to replace it or cover part of the repairs. Next, you should move all the furniture on your carpet to a separate area to leave the floor open. Use a disinfectant solution to scrub down your carpet. If you're replacing the carpet, you can cut through the carpet and padding around the area and then pull the carpet and padding out. Drying your carpet could take a week or longer. You'll need large industrial fans and dehumidifiers. If you don't notice a difference in your carpet after a few hours, you'll need to replace it to avoid mold growth. Although you can fix water-damaged carpets, you don't need to do it alone. The team at ServiceMaster of Lincoln Park is here to help with all of your water restoration needs. Ripping up carpet isn't as easy as it seems. Be careful of injury, unseen mold growth, and finding a place to discard your carpet. Mold is a serious concern in homes that have sustained water damage. It can start growing in 24 to 48 hours after a flood or water leak. It's better for your health to allow a professional to fix your water-damaged carpet, so you don't have mold growing in your home. Don't wait to contact us for help with cleaning up your house. 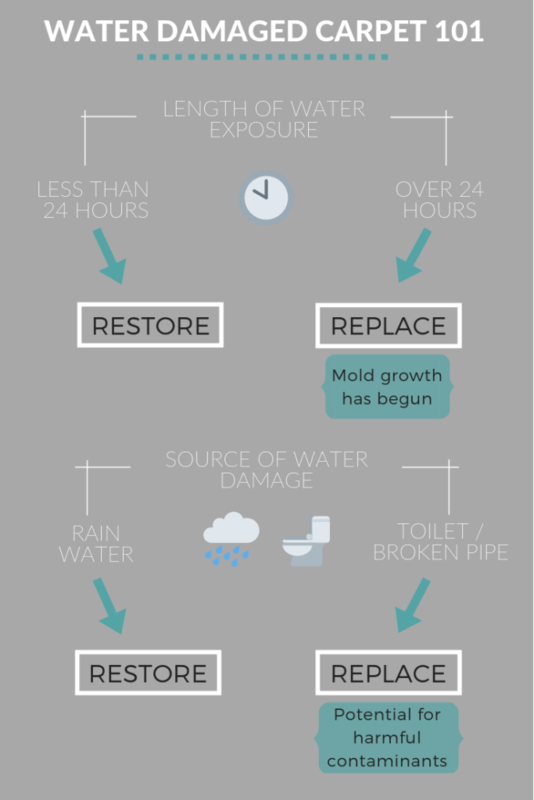 Learn more about our water restoration and residential cleaning services today!